Can Technology Blog Titles Get More Misleading? 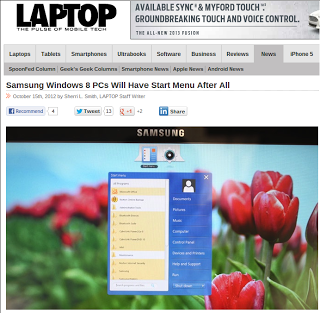 Sherri L. Smith, writing for Laptop Magazine created an article titled “Samsung Windows 8 PCs Will Have Start Menu After All” that has to be one of the most bizarrely misleading titles I’ve seen in a while. The article is based entirely on a piece of software by Samsung that will imitate “Windows’ familiar Start Menu” and yet the title says “Have Start Menu” not ‘Have a kind of Start Menu’ or ‘Have a mimicked Start Menu’, the title is talking about the actual Start Menu, but that’s false. There isn’t one in Windows 8. Microsoft Surface RT Gets Priced – Can It Compete? This is interesting. Microsoft’s new RT-Based tablet devices have been priced and are available for pre-order online in the US. Pricing is is $499 US on the low end (with 32 GB) and $699 on the high end. My thoughts are this device can’t possibly compete on that pricing. This tablet is more analogous to the iPad than a PC – and the low end iPad (16GB) starts at $499. Many expected this device to undercut Apple by at least $100 to gain market share- but that’s not happening – well, it does, see below. It still looks like a non-starter. And, remember, this is an ARM Cortex-A9 CPU that will not run any of your current Windows x86-based applications. 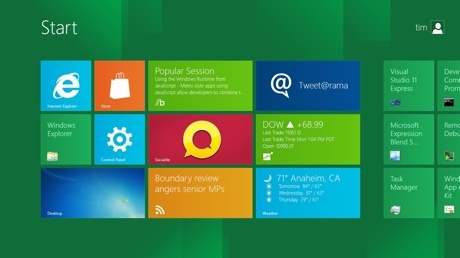 This also includes Office Home and Student 2013 RT Preview. The landscape for encryption tools today is incredibly dense. Certainly, this process is done in many novel ways and with tools that far surpass that of the simple. One of the most amazing encryption tools (for example) is TrueCrypt – I covered it in a recent “That Great Tool” post. While tools like that offer a great deal of options and uses, I’ve always thought there was room for the simple too. CRCutil is just that – a simple way to compare two files or encrypt and decrypt small amounts of text. Read on for more details and a download link for this free tool. While thinking of free tools to add to the growing list available here, I thought of a specific problem I attempted to solve many times over the years. essentially, I wanted to find various ways to automate the log off, shut down and reboot processes of Windows. In a more fragmented way, these tools were borne of necessity and never grouped together while I created them in the late 1990s – until now. Today, I give you three new tools to download and I simply call them Reboot / Log Off / Shutdown. Read on for download links and details. One of the biggest casualties with Windows versions after XP, was the loss of all those settings you could control in the “Display” applet in XP’s Control Panel. They allowed you to turn off a bunch of things that would improve performance for slower computers – and in some cases – take an unusable machine and make it useful again. Are you looking for those settings that will let you “Turn off Window Contents while Dragging” or how to turn off the “Aero” interface? look no further, all the details are here. New with Windows Vista (and included in later versions) was the Windows Mobility Center. This great little tool typically allows mobile users to see and control many of the most obvious and useful settings on a Windows machine. The settings are arranged as tiles on a single window with each tile containing a specific setting. 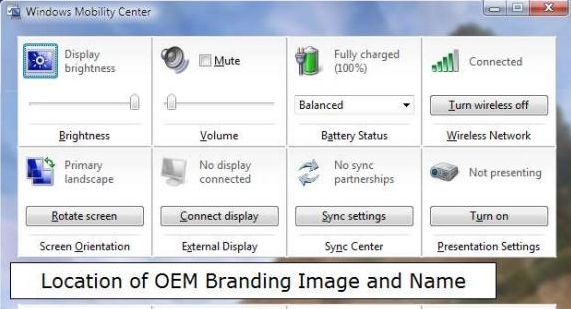 Also possible by OEMs, is extending the interface to include other tiles for controlling a system. I thought, this is cool and useful but really, really ugly. I thought, there must be other stuff I can do with this.